I totally forgot that just having a web video stream of what is happening on the typewriter is not enough. What if actually a few people want to watch it at the same time? Bummer, have to investigate that. So far tests showed not even enough frames come out of that android IP cam app I am using right now to show the actual experience of the typewriter typing by itself. Any ideas for a solution? Please let me know. Also I fried another one of the tiny motors with gears that make the new lines. I had an extra one and started just printing one letter per row. So since I did not get the cartridge return working, I just disabled the spring that would push the cartridge further and the typewriter would just print on the small cashier paper roll one letter a line. A workaround I am not happy with. I will need to get some more supplies now to connect all keys and make sure the tweets to @lepetiteprinter will end up in the print queue on the server so the raspberry pi can grab them from there. So from there on we can at least print in a straight line until I have the cartridge return figured out. Any new ideas what to try for that? Actuators that can pull about 20 cm? 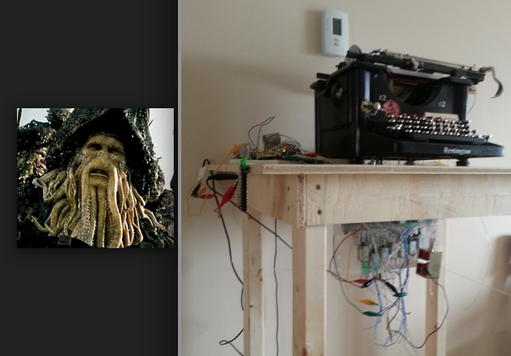 Harvey Moon recently turned a typewriter (also Remington, different model) into a printer for an art installation. Check it out, great work! Automatic Typewriter from Harvey Moon on Vimeo.